Venuemob Manager availability calendar – what is it, and how do I use it? Busy, quiet, or business as usual – let your availability calendar do the talking. The availability calendar allows you to mark key dates for specific spaces on your listing as 'booked', or 'available'. 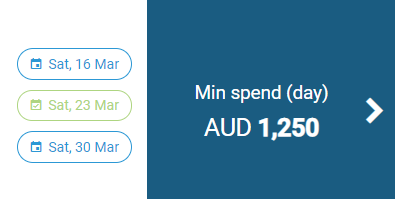 This availability is displayed in the search results when a customer enquires for their event, for their specific date/day. The preceding and following week is also displayed. Eg: a customer enquires for a birthday party for Saturday, 23 March. The availability for Saturdays 16 and 30 March would also be displayed. The customer can click on these date icons to view the whole month's availability for that space. What is the advantage of using this feature? The greatest advantage of using this feature lies in your ability to sell dates. If you have a few dates you want to fill fast, by marking them as available in the calendar, this will boost your space in search results. The green 'available' marker is also a time-critical incentive for the customer to enquire, and secure that space. Similarly, if your venue keeps receiving enquiries for December and one of your spaces is completely booked on key December dates, marking those dates as 'booked' will virtually eliminate those unqualified, dead-end leads. Add availability, receive a boost in search results! More often than not, the first question a customer has for a venue is whether the space is available. Eliminate that question with knowledge, and you're already one step closer to a booking. That's why we're boosting venues with availability data set (whether available or unavailable) for the next three months at any time. How do I add/change the availability of my spaces? Once you're logged into Venuemob Manager, click on Availability in the left-hand column. You'll see each of your function spaces listed down the page, with the next three months ahead ready to be updated. We recommend keeping the next three months as up to date as possible at any point. Why? If it's January now, chances are customers are booking events in March and beyond. You can mark individual dates (for instance, individual dates you know for certain are unavailable or completely booked out), a whole month in bulk, or particular days of the week in bulk (for instance, all Saturdays in December). 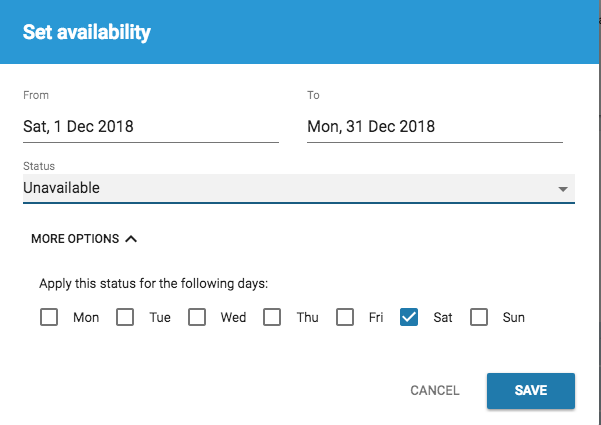 To mark specific days of the week in bulk, click on that day on the calendar and then select booked or available from the status drop-down menu. The image above would mark all Saturdays in December as unavailable. First, select the date range. In this instance, we would select Saturday 1 December to Saturday 29 December. Then, make sure it's Saturday that's ticked. Then, we would select unavailable from the status drop-down menu. Then, click save. Finally – it is important that the dates you mark as available are accurate. Venues that mark their spaces falsely as available as a blanket rule may be deactivated. Besides, it's not a great look when a customer is keen to book your space, think it's available, only to be told otherwise.